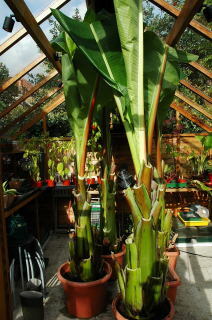 Overwintering of Ensete Ventricosum is possible if you have a frost-free greenhouse at your disposal. The process involves removing the majority of leaves. Digging the plants out of the ground and transferring them to pots for the winter. Do not leave this process until the night before the first frost. It is beneficial if your Ensete has a couple of weeks to establish itself in its new home before things turn nasty. 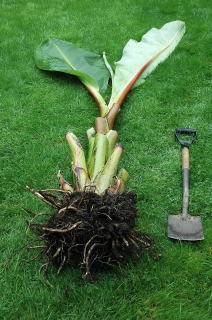 The next thing to do when overwintering Ensete Ventricosum is to dig it up. One positive aspect of this task is that you do not have to worry about damaging any roots. When transplanting a conventional plant, every effort is made to keep the root ball in tact. You need not concern yourself with such things. Because of this fact, digging up your plant is relatively easy. Use a spade. I prefer what is known in Britain as a border spade. The small size of the blade transmits power more effectively than a big heavy spade. Slice down vertically through the soil all the way around the stem about 6 inches out from the base. Using your spade, lever the plants out of the ground, slicing through any deep roots under the plant (It is a good idea to get into the habit of keeping receipts when buying spades, I am forever snapping the handle or blade of the spade.) A word of caution. 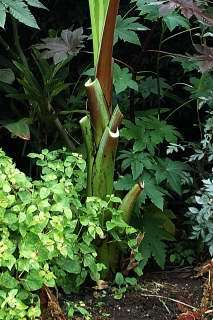 Where the leaves join the stem, there is a tendency for rain water to collect. When lifting the plant there is a good chance that you will get wet. Don't wear your best clothes for this job. Also if you feel that the job is too much for one person, get some help. The stems can be quite heavy, particularly if there has been a lot of rain recently. Whilst your plant is lying, bewildered on the grass, you need to prepare it a pot to live in. Prepare the pot in the greenhouse. There is no sense in carrying plant, pot and compost all together when it can be done separately. I use a peat free multi-purpose for this purpose. Large plastic pots are the best option as in the spring you will need to manhandle the pots back in to the garden. The lighter the pots the better. Large plastic pots are also quite expensive for what they are. As you go about your daily life, keep an eye out for anybody having their garden overhauled. Often they will be planting new trees or whatever and will be discarding the large pots. If they catch you rummaging about in their rubbish skip, claim you are trying to save the planet. This image shows how new roots have begun to grow from the base. 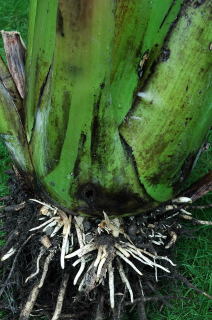 A wet autumn stimulated the plant to put out new roots where they are needed. It is these new roots that will grow and sustain the plant during winter. Pop your plants into the greenhouse. When potting up your plants, do not over fill the pots with compost. As the new roots form, they have the tendency to push the plant up ,filling the pot from below. If you over fill the pots and the compost level rises over the rim of the pot, watering becomes awkward. Keep the greenhouse at a minimum temperature of 3º Celsius during the winter. Keep the compost on the dry side but not totally dry. 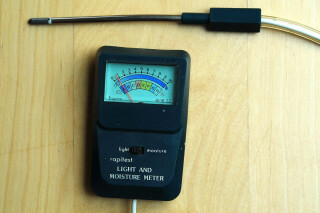 One gadget you will find useful is a moisture meter. This is an inexpensive, battery free way of taking the guess work out of watering during winter. You simply push the probe into the compost and a needle instantly indicates the level of moisture present. Your plants may be subject to minor infestation of aphids. This is never on the scale that canna and other plants may suffer. They can easily be controlled with a soft 2 inch paint brush. 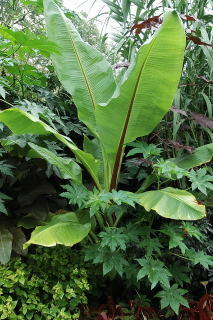 As winter turns to spring, your overwintering Ensete Ventricosum will begin to stir. 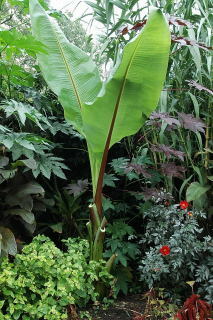 Depending on the height of your greenhouse, you will need to trim the tops of the leaves as they emerge. The plants featured above were germinated from seed. They spent their first season in pots and were then let loose into the garden for their second growing season.